Great for an appetizer or a main dish. Preheat broiler with rack 5 inches from element. Spray two 24-cupmini muffin tins with nonstick spray; set aside. Bring a large post of salted water to a boil. Cook shells in boiling water until al dente, 12-15 minutes; drain and rinse under cold water. Heat oil in a skillet over medium heat. Add chicken and saute until cooked through, 8-9 minutes per side; cool slightly, then chop into small pieces. Warm cream and garlic in a large saucepan over medium-low heat until steaming. Whisk in butter until melted. Add 1 c. Parmesan, 2 tsp. pepper, and 2 Tbsp. parsley. Increase heat to medium-high and simmer until reduced to 1 cup, about 10 minutes. Stir in chicken and remove from heat. Fill each shell with 1 heaping Tbsp. chicken mixture. Stagger filled shells, open ends up, in every other muffin tin well to prevent them from sticking to each other. Sprinkle shells with remaining 1/2 c. Parmesan. 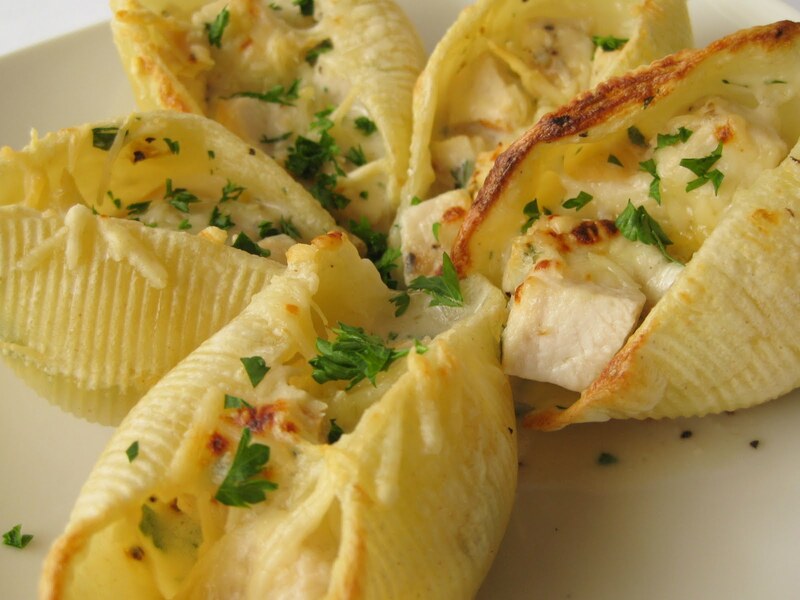 Broil shells until sauce bubbles and Parmesan melts and is golden, about 2 minutes. Garnish shells with remaining 2 Tbsp. parsley.